Cat owners are faced with an amazing range of different cat diets, and choosing a diet is largely a matter of personal choice. When you have decided which food provides the best diet for your cat, subject to the limitations of your finances, you will need to change your cat from his existing diet to the proposed one without any trauma or diet-related stomach upsets. There may be times when through necessity, your cat has to change his diet, so it is a good idea to broaden his gastronomic horizons. Some cats will always be resistant to change, and you have to accept that however hard you try to change your cat over to his new diet, your cat will let you know that the old diet is the preferred one. Equipment: A variety of feeding bowls, a spoon and a can-opener that are specifically used for your cat’s own meals. Some plastic bowls can cause a cat to develop skin sensitivity; stainless steel bowls are very durable and are easy to clean. Training objective: To turn your cat into a gourmet. Always use a clean feeding bowl – cats dislike eating from dirty dishes. 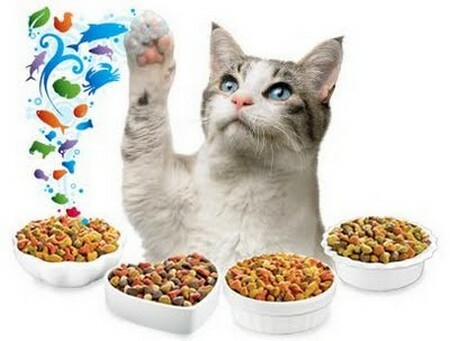 Mix half the quantity of your cat’s existing diet with half the quantity of the new food. If you feed your cat twice a day, use only one-quarter of the daily recommended amount of each food. Feed this amount for at least five days so your cat gets used to the taste and texture of his new diet while still being reassured of the availability of his old diet. After the fifth day, slowly increase the quantity of the new diet, on a daily basis, and take out the same proportion of the old diet. By the time you have reached the tenth day, your cat should be switched over to the new diet completely. Praise your cat when he has finished each meal. If you are changing your cat over to a dry diet from a wet diet, do not fill the bowl up with dried food without measuring the amount included. Many owners tend to overfeed dried food; most complete diets only recommend 2-3 ozs a day. Be regular in.your feeding habits with your cat. Regular feeding leads to regular elimination of bowels (unless your cat is sick).